My first playing day in the golf hotbed that is the Pinehurst-Southern Pines-Aberdeen area of North Carolina was darn near perfect. I played a morning round Saturday at Legacy Golf Links in Aberdeen, where former Mentor resident Bradley Poplyk is head golf professional. FYI, I'm saving a fuller story about Poplyk for tomorrow's installment of "Affordabili-TEES'' because the weather forecast for Sunday is bleak. In advance of my scheduled 9:32 a.m. tee time at Talamore Golf Club, I'll head back to Legacy to do a full interview with the native Northeast Ohioan and get him on video. Legacy opened in 1991 and was designed by Jack Nicklaus II. I liked everything about the place, from its challenging but fair layout to consistent, thorough on-course yardage markers. I also appreciated being told before I headed to the first tee that the greens at Legacy have some cosmetic issues. Bob Kelley, formerly of Columbus, explained that the discoloration was due to last summer's excessive hot weather in the area. The owners of Legacy aren't messing around with this problem. From the middle of June until the end of August, the course will be closed so that all the greens can be rebuilt. For what it's worth, I thought the greens rolled fairly well despite the discoloration and structural issues I'm sure only an agronomist can understand. 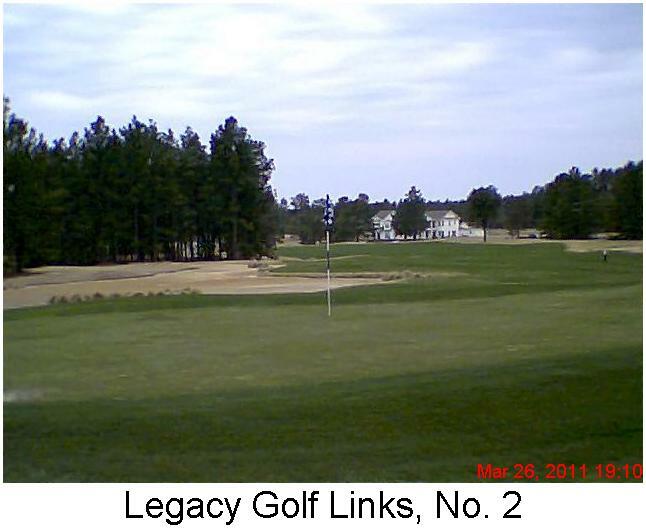 If you plan to be in the Pinehurst area between now and the shutdown, don't hesitate to play Legacy. 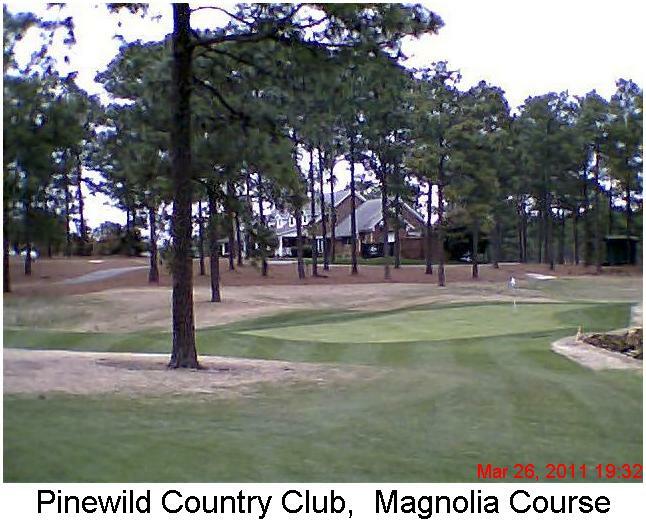 The afternoon round was at Pinewild Country Club's Magnolia Course, a Gene Hamm design that opened in the early '70s. I got in nine holes, playing the back nine. Then the rain arrived, as predicted, and made easy the decision to call it a day. Based on the quality of those nine holes, and the high level of challenge they present, it's easy to see why Magnolia has hosted sectional qualifiers for the U.S. Open and other regional tournaments. Saturday's experiences at Legacy and Pinewild bring me to the overriding point about golf in the Pinehurst area and how you can make it affordable. Travel brochures trumpet the fact there are 40 championship-caliber courses in the Pinehurst-Southern Pines-Aberdeen area. In most parts of the country, in this economy, the concentration of so many courses in such proximity to each other would produce downward pull on walk-in greens fees. That's not the case here. Exclusive of twilight rates, none of those 40 courses has a walk-in greens fee that fits "Affordabili-TEES'' profile of $20 to $35 or slightly higher for a premium golf experience with amenities. Pinehurst is not immune to changed economic realities, however. To maintain acceptable levels of business, the golf courses and area hotels have formed alliances to offer golf-lodging packages that, when you break down the unit costs, are great values given the quality of the golf experience. That's why I provided contact information for the Comfort Inn, where I'm staying, and for the Pinehurst, Southern Pines, Aberdeen Area Convention and Visitors Bureau. Golf down here isn't cheap, but by taking advantage of the golf-lodging package that fits your budget, it is affordable.